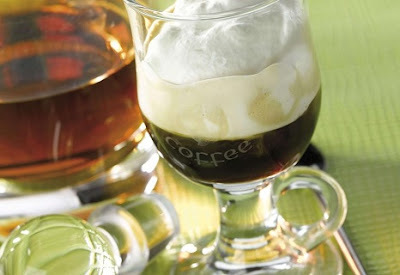 Did you know that there is a National Irish Coffee Day? Well, there is and it's on January 25th. These days there seems to be a "National Day" for anything and everything! If you enjoy drinking a good Irish Coffee from time to time, I think you'll enjoy our guest recipe today that's courtesy of KRUPS. The recipe will make 1 serving. In a saucepan, heat the whisky then incorporate the light brown sugar in order to dissolve it. Pour the mixture into a glass and pour the espresso on top. Lightly whisk the cream and arrange it carefully on top of the drink. I like the idea of adding the teaspoon of brown sugar to the recipe. I might also add a 1/2 teaspoon of cinnamon.